Charming villa fully equipped to accommodate up to 10 people. 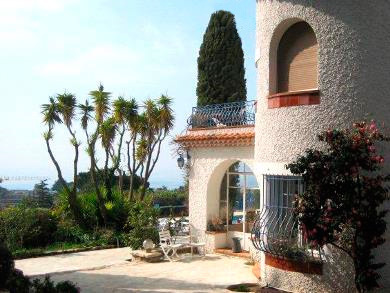 It will charm you with its comfort and decoration local in a quiet, calm while having a panoramic view of the entire Cannes bay and surrounding countryside. Horizon Blue Villa is designed to organize party in the very spacious and comfortable common area and to appreciate the marvelous view particularly from the pool and Jacuzzi area, the open space living room. Consisting of a veranda, living room + dining room, a kitchen, five bedrooms with double beds, 4 bathroom (3 en-suite), 2 separate toilet, laundry, ample parking space with a huge private garden, swimmingpool, jacuzzi, 2 fish ponds. All towels and linen is provided.